*Revision August 2012*I'm awarding an extra half star to this book because dammit, I'm still talking about that office scene! I've read content from the mild to the taboo extreme in terms of steam level and this scene still remains one of my all time favorites of any book, any series. Why? Because it was unexpected from a character who I thought I had figured out. Man, I really loved the office scene.Never mind that it's a Mead series, so of course I'm going to love the characters and plot. In this case, it really was all about that one scene. It's still in my head. I want to go back and re-read it again. *Original review Feb. 2011* - mild spoilers for those who haven't read up through book 4After all of my bitching about slow starts for the past 3 books, I finally hit book Nirvana again! Thank you Richelle for finally showing me what I already know you are capable of - making me care enough about the characters to find passion in what does or does not happen to them.The books that get the highest ratings from me tend to be the ones that can make me feel a range of emotions. Whether it be fear, compassion, wistfulness, pain, hope, etc. it doesn't matter. I just want my stories to give me more than one note. Succubus Heat delivered on this and then some. One moment I was thrilled with Georgina finally getting to see the sunshine, only to be crushed when it was snatched away from her.Seth was especially heartbreaking in this one. I almost feel like he's the Rose character in Vampire Academy (one of Mead's other series) - always wanting what he knows he shouldn't have, and putting himself at risk to try and get it. Georgie this time is the Dimitri. She puts her own happiness aside for the sake of those she loves. Albeit, this couple has a lot more heat on their side in this particular episode.I'm so tempted to go a full 5 stars on this just because I really enjoyed the complexity of this particular read, with much less side character action, but I'm going with a 4 rating because the whole Vancouver plotline sort of stalled me for a minute. 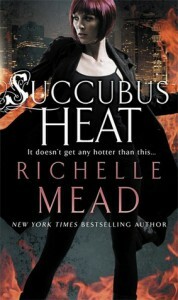 Even with that, I thoroughly enjoyed Succubus Heat and was excited to see the return of Roman too!